Summary: A bad storm, two canceled flights, stuck in an airport with a hot stranger and the guy who broke her heart... what could go wrong? 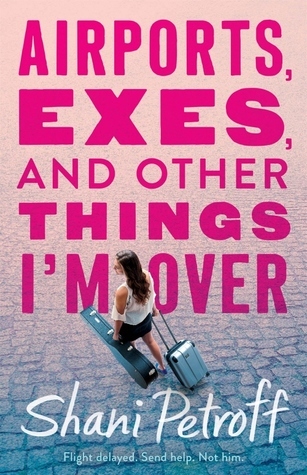 The Good, the Bad, and the Ugly: Romances that begin at airports can be great fiction fodder. The Statistical Probability of Love at First Sight is one of my favorite examples of this trope. Unfortunately, where that YA fave succeeds, Airports, Exes, and Other Things I'm Over falters. From the start, I expected Sari and Fitz to have more of a flirtation and an almost-relationship at the very least. Instead, Sari's romantic attentions are entirely focused on her ex who can't take no for an answer. Spoiler alert: no, he technically didn't cheat on her. But the fact that he kept following her and wouldn't take no for an answer kept me from rooting for them. There was little-to-no character development for Sari, Zev, Fitz, or anyone else. And my word, Sari's mother was ridiculously overprotective. She took overprotective YA parent to a whole new level. I also would've liked more airport culture as opposed to so much drama. YA still tends to be my favorite age category because of how creative and fun it can be, but as of late, the drama in YA books tends to exhaust me. But anyways, airports can be such fascinating places besides causers of stress, so it would've been fun to see how Sari views all of that beyond the stereotypical long lines and unhelpful help desks. Content warnings: There was some mild language if I remember correctly? Also the ex-boyfriend has a panic attack on the plane. Will I be adding this book to my library? : Nah, son.